Here you find all Gaming Cases on sale on MagaMercatino! Gaming Cases There is 1 product. Premium, heavy duty fabric shell. 10 Modular inserts allow for customized interior compartments to suit individual needs. 12" wide pocket to hold rule books, pamphlets or Ultra PRO 9-Pocket portfolios. 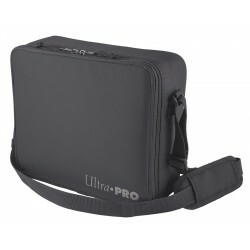 Adjustable padded shoulder strap extends up to 60" in length.